Traditional Aran knit sweaters are enduring Irish gifts. They are both practical and beautiful, as well as being clearly Celtic. The intricate patterns that made them famous were developed by the knitters of the Aran Islands. Fishermen throughout the North Atlantic wore similar, sturdy, warm sweaters to protect them from the elements at sea. But in the Aran Islands, a particular artistry developed. On the pragmatic level, it was important that whatever fishermen wore to sea was warm and insulated them. 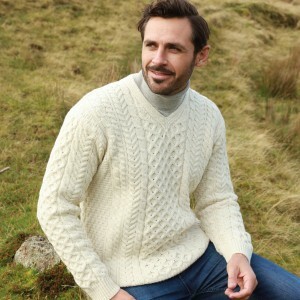 Aran sweaters are made with wool, which was the most water-resistant type material around long ago. The practice of cabling and twisting the stitches served to make the sweaters warmer. But the patterns that developed were much more than pragmatic. They are stunning. Women in that time and place had hard lives, devoid of any labour-saving devices. It would be understandable if they simply churned out the easiest sweaters possible. But they did not. Instead, they devised elaborate, richly detailed patterns. Their men were gone all day at sea. They would have been worried, always aware that sometimes, the waves defeated the fishermen. Not everyone who left came home at night. These complex patterns, rich in symbolism, are labour-intensive love letters. But what do they say? Aran knitting involves three – or even four – knitting needles. Knitting these patterns by hand took great skill and much time. Aran knitting is not ancient. These aren’t mystical motifs from pre-Christian Ireland. Rather they are designs by expert knitters, which became popular Irish gifts. We don’t know if they tried to create particular symbols or simply discovered them as they experimented with cabling and twisting their stitches as they knit. Probably a bit of both! Honeycomb – This flexible stitch can be used in wide or narrow sections of the pattern. Bees work hard and produce a sweet reward. The honeycomb stitch represents earning a reward to enjoy and savour. Tree of Life – The tree of life is an ancient Celtic motif. It features branches rounded down and roots extending up to meet them in a circle to represent the holistic cycle of life. The tree of life knit stitch is not rounded like this, but is generally believed to have the same meaning. Trinity – In a country with a deeply Catholic history, the meaning here is obvious. The women knitting for their husbands, sons and brothers going to sea certainly would have prayed for their safety. Moss – Carrageen moss grows on the Aran Islands, so it is believed to represent home and the wish for the fishermen’s safe return to the land. Cable – Often used as a border between panels, the cable stitch resembles the ropes found on ships. Diamond – No, it doesn’t represent wealth. It reflects the shapes in a fishing net, hopefully a full one! Today, Aran knitting is used in a huge assortment of Irish gifts from traditional sweaters and other winter accessories to tea cozies. If you are giving an Aran knit to someone this Christmas, it’s nice to be able to explain the different stitches.